Lock your wallet in a safe and throw away the key. You are about to experience what could potentially be the best week in gaming history. For those of you living under a Dwayne Johnson, here's the skinny on what to expect from November 15 to 22. Not only are two new powerhouse consoles launching this week in November, but Nintendo is throwing their hat into the ring with two new Mario titles and the highly anticipated sequel to The Legend of Zelda: A Link to the Past. As you may have noticed many of the Xbone and PS4 launch titles are similar, and some are games that will have already been out. But they will officially launch for the systems on their respective launch dates. Big third-party games are dropping as well, the most recognizable being Watch Dogs. Kids and childish adults (like myself) can also look forward to the new Adventure Time dungeon crawler which is coming to many different consoles on the 19th. It's a little over two months away. Are you ready? 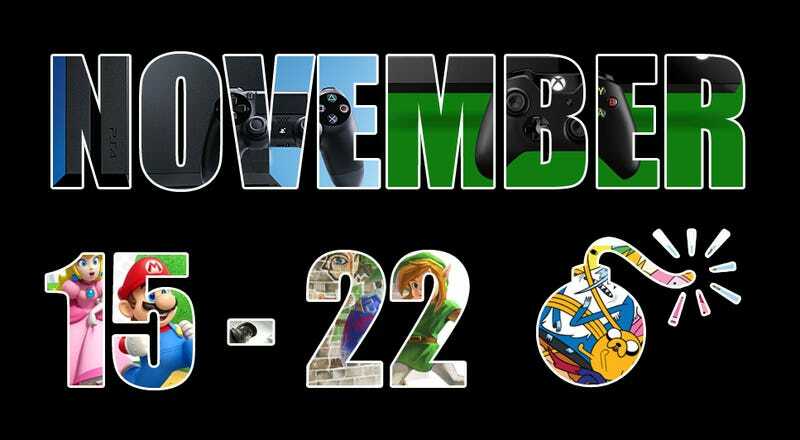 What games or systems are you planning on picking up during Gamermageddon?